Shadowrun Legends: Headhunters, chapters missing? So I bought all the Shadowrun Legends and have been making my way through them. I have a question about Headhunters though. Does it really end with the conversation between Archangel and Skater on the staircase in Auburn or have it accidentally been cut short when digitized? Re: Shadowrun Legends: Headhunters, when does it end? Seems like there are 13 missing chapters in the electronic version of the book. Any chance of an update? 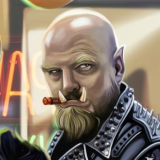 Re: Shadowrun Legends: Headhunters, chapters missing? "And Skater knew that was all the answer he was going to get." That's super disappointing to hear that Headhunters isn't complete. I was very surprised when reaching the end myself. It was an interesting open-ended method of ending the story, though as I was a little bit in disbelief I sought a few answers. I hope that it can and will be solved soon by an updated version. Any chance your download was interrupted? Does anyone else have a copy of the ebook, and does it have the same problem as PiXeL01's? There have been complaints about it on amazon as well. Also the page following the part I quoted feature Catalyst’s “credits” which is found at the end of all their ebook novels for legends at least. Either they didn’t get the full book begin with or someone accidentally deleted a fifth of the book. Also, since I’m on iOS corrupt files usually cannot be opened in the first place. Quick note to let you know I've pinged Jason on this to make sure that CGL is aware of the issue.